Here’s one of the pictures that corroborates this. The picture shows ‘Jewish’ Senior Officers In Hitler’s Army: Erhard Milch, Wilhelm Keitel, Walther von Brauchitsch, Erich Raeder, and Maximilian von Weichs during a Nazi rally in Nuremberg, Germany, 12 Sep 1938. 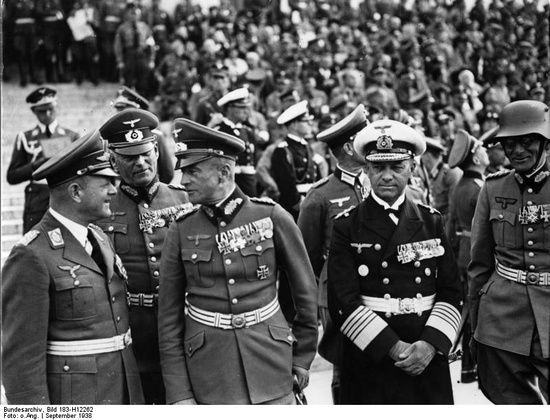 ‘Jewish’ Senior Officers In Hitler’s Army: Erhard Milch, Wilhelm Keitel, Walther von Brauchitsch, Erich Raeder, and Maximilian von Weichs during a Nazi rally in Nuremberg, Germany, 12 Sep 1938. PS: In approximately 20 cases, Jewish soldiers in the Nazi army were awarded Germany’s highest military honor, the Knight’s Cross. THOUSANDS of soldiers of Jewish parentage served in Hitler’s army during the Second World War and fought for the Nazi leaders who ordered the extermination of the Jews. Discoveries by a 25-year-old American student, published for the first time by The Telegraph, show that Hitler knew of the Jewish origins of dozens of his senior officers and signed documents declaring them to be « of German blood ». German law under the Nazis from 1935 forbade anyone with a Jewish grandparent from becoming an officer. But the German army personnel office in January 1944 knew of 77 « high-ranking officers of mixed Jewish race or married to a Jew » serving in the Wehrmacht, the German armed forces. All 77 had received a declaration from Hitler that they were « of German blood ». The list has been discovered by Bryan Rigg, a history student now working at Cambridge University, who has traced former members of the Wehrmacht who were Jews or had Jewish parentage. He has interviewed hundreds of former soldiers and their families and has examined the individual army personnel files, in the German federal government archives, which reveal how much the Nazi leadership knew of their ancestry. Mr Rigg has found evidence that Hermann Goering, head of the Luftwaffe and Hitler’s chosen successor, falsified the fatherhood of Field Marshal Erhard Milch, his deputy, who was, by the Nazis’ own definitions, a half-Jew. He has found that the Nazi leadership awarded the Knight’s Cross, Germany’s highest military honour, to soldiers who had previously been discharged because of their Jewish ancestry, then reinstated. He spoke to one German officer who visited his father in a concentration camp while wearing campaign medals. The widow of one Knight’s Cross winner told him that her husband, a half-Jew, was deeply upset by a visit to the Warsaw Ghetto, on his way home from fighting in Russia. Mr Rigg has identified a half-Jewish veteran of World War I who led a team from German military intelligence to Warsaw in September 1939 to help the leader of the Lubavitcher Jews, the Rebbe Joseph Schneersohn, escape to America. Brought up in the Bible belt of Texas, Mr Rigg found that his own ancestors were German Jews. Some died in Auschwitz, others fought in the Wehrmacht. THE German army personnel office prepared a list in January 1944 of 77 « high ranking officers of mixed Jewish race or married to a Jew » serving in the Wehrmacht, the German armed forces. All 77 had received a declaration from Hitler that they were « of German blood ». Among the 77 were two generals, eight lieutenant generals, five major generals, and 23 colonels. The list was drawn up, on Hitler’s instructions, so that, late in the war, the officers could be discharged. The officer drawing up the list admitted in January 1944 that it was incomplete. Bryan Rigg’s research has uncovered not just the list but many more such high-ranking officers in the army, the navy and the Luftwaffe. « I could add 60 names to that list, » he said. Mr Rigg has found documentation to show that in the case of one field marshal whose father was Jewish, Goering and Hitler ruled that his « true father » was his mother’s uncle and that the field marshal was therefore of true German blood. His research has so far uncovered 17 instances where the Nazi hierarchy awarded the Ritterkreuz, or Knight’s Cross, Germany’s highest military honour, to someone known to be of Jewish parentage. Many of the subjects of Mr Rigg’s research were not religious Jews. But the law of Reich citizenship and the law for the protection of German blood, promulgated at Nuremberg in 1935, defined as a Jew anyone with at least three Jewish grandparents. They also created two categories of Mischlinge – those of mixed race – with either one or two Jewish grandparents. Both Mischlinge 1 (half-Jews) and Mischlinge 2 (quarter-Jews) were denied full citizenship of the Reich. In 1940, those Mischlinge with two Jewish grandparents were expelled from the military. The expulsion order was repeated in 1942, 1943 and 1944. Those Mischlinge with only one Jewish grandparent were allowed to continue in the military, although not to be officers. It appears the Mischlinge have been neglected by historians, perhaps because they were neither Jewish victims nor Nazi executioners. Mr Rigg, who began his research into Jews in the military when he was at Yale University, said that, at first, his professors had tried to dissuade him, expecting him to find nothing. One of his interviewees was Helmut Schmidt, the former West German Chancellor, who had been an officer in the Luftwaffe though his grandfather was a Jew. Herr Schmidt, Mr Rigg recalled, had estimated that there were only « 15 to 20 » like him. Mr Rigg said thousands of Mischlinge and Jews served in the military under the Nazis. He had documented 1,200 cases and interviewed more than 300 soldiers or their relatives. He had collected 30,000 documents and detailed the Jewish ancestry of two field marshals, 10 generals, 14 colonels and 30 majors. He said: « While these soldiers served, many of their Jewish relatives were murdered in concentration camps. Close to 2,300 Jewish relatives of a group of nearly 1,000 soldiers I have documented were Holocaust victims – cousins, aunts, uncles, grandparents, mothers, fathers. » One of his interviewees was a Wehrmacht veteran who visited the Sachsenhausen concentration camp in 1942 wearing the Iron Cross he had earned in battle. Challenged by an SS officer, he said he had come to visit his father, a Jew. The SS officer said: « If you did not have that medal, I would send you straight where your father is. » But another man he interviewed, now aged 76 and living in Germany, was a full Jew who escaped to German-occupied France in 1940 and then enrolled in the Waffen SS under a new name. Mr Rigg said the people he interviewed were at a loss to know their place in history. « They don’t know where they stand, » he said. « If I was in the German military and I lost my mother in Auschwitz, am I a victim or a perpetrator? Because these people have not been written about there is no place for them to tell their story. No one thought it was an issue. » He said the Mischlinge had been ignored because « neither side wants to claim them ». « The Germans who feel guilty don’t want to talk about them. The Jewish community doesn’t want to claim them because it goes against everything they have been taught about the Holocaust, » he said.